Our frost-proof trellis finial creates a four season tuteur style trellis (pyramid) using four poles of your choice. We recommend bamboo, iron reinforcement bars, copper pipe or hardwood branches, in any length you desire to create a great architectural presence in your garden all year long. Very useful for climbing plants, ivy, clematis, morning glory and even in the vegetable garden to support tomato plants and beans. At Goff Creek Pottery we leave them out all winter dedazzled with shimmering white Christmas lights (see our blog for photo). 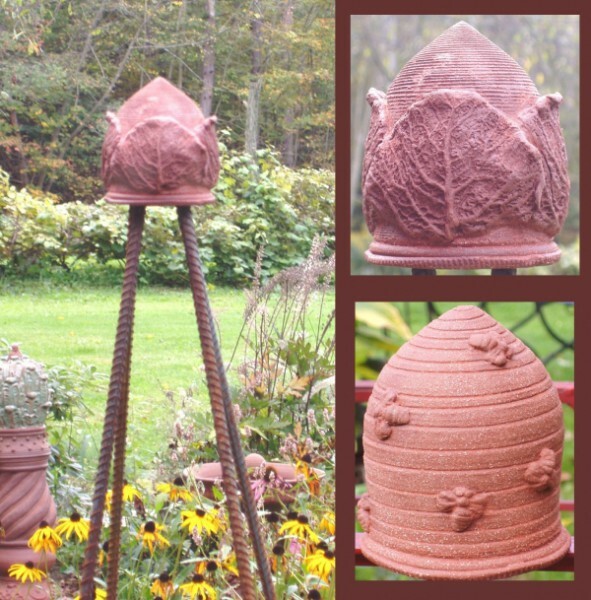 Choose from Cabbage or Beehive designs. Natural clay color. 5 inches high x 5 inches wide. $35 each.